Are the Shanghai Tunnels Haunted? The Shanghai tunnels are a series of underground passages and tunnels which run underneath the area of Chinatown to the central downtown section of Portland. Less commonly known as the Portland underground, they were first created as a way of moving goods from the docks at Willamette to various businesses without having to contend with street and train traffic. 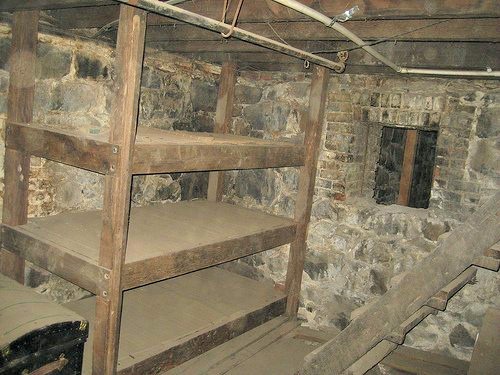 They connected many basements and supply rooms along the network for businesses such as bars and hotels and to this day still provide access to many of the places that were originally connected to them, though the businesses now choose to receive supplies through more conventional methods of delivery. When they were first built is unknown, as they were constantly expanded to supply more and more businesses as the city grew in size, but it is thought a lot of the tunnels are almost as old as the city itself. Though many parts of the tunnels are now sealed off, In 1990 a Portland businessman named Bill Naito was quoted in "The Oregonian" as saying the tunnels still ran underneath Northwest Couch, Davis and Everett streets. As for the the use of the tunnels for the purpose of Shanghaiing, it is not known if they were actually used for this, though historians claim that the practise did happen in Portland. Just incase your not sure Shanghaiing is when people are kidnapped and forced to work about ships as sailors. Today many parts of the tunnels are open to the public as part of guided tours and there are various groups which hold ghost tours here. The main reason the tunnels are thought to be haunted is due to the people who suffered at the hands of "Crimps", which was the name given to the people who used to kidnap those they later sold to ships to work as slaves. There are many stories about how the "crimps" would kidnap men and women from the bars and brothels along the tunnel network and lock them in rooms awaiting a ship to come in. It is within these room that many people were thought to have died from hunger, thirst and neglect. The Shanghai tunnels were also a favourite spot for the cities many opium addicts who could indulge in their addiction free from the bother of authorities, though this would have made them very easy targets to be kidnapped, so long as they didn't overdose first. As for paranormal activity these pretty much everything you could possibly have in a haunted place. Tales of strange lights and noises, such as heavy footsteps and banging sounds coming from empty areas are amongst the most commonly reported paranormal happenings. People often report a very strong and dark presence when in many of the smaller side rooms, such as having a very angry person standing very close, staring intensely at you. People have been known to have to flee these rooms on a regular basis due to the uncomfortable presence here, and the stories of people also being touched or the feeling of someone brushing past you certainly don't help. Who the spirits that haunt the tunnels are isn't known, as they are most likely the spirits of the unknown working class, but the basement of the Lotus Cafe is believed to be haunted by the spirit of a past bartender who used to help the "crimps" capture people, and now lingers to make the current staff feel as uncomfortable as possible.